From the team at myStockOptions.com and myNQDC.com, this blog has commentaries on equity compensation and NQ deferred comp, tips on the related tax and financial planning, updates about new stuff at our websites, and sometimes the lighter side of the topics we cover. We do our best to keep the writing lively. Copyright © 2010–2019 myStockPlan.com, Inc.
Tax-return season is in the ninth inning as the IRS deadline of April 15 approaches. Many issues can complicate a tax return involving income from stock compensation or stock sales, particularly this year. The new Form 1040, shifts in the reporting of capital gains tax and AMT, and the changes under the Tax Cuts & Jobs Act have made this tax season very challenging. Need to take your tax game into extra innings? Fortunately, the process for getting a filing extension is easy. However, it's easy to make mistakes that lead to IRS penalties. If you need extra time for your tax return, you can get an extension of the federal filing deadline by up to six months. No explanation or signature is needed. You can request an extension in any of three traditional ways: on IRS Form 4868, through a paid tax preparer, or via tax-return software. It's vital to understand that an extension of your tax-return deadline applies only to the filing of your return, not to the tax itself, which you must still pay by the original IRS filing deadline. Therefore, if you get an extension you must accurately estimate how much tax you must pay no later than April 15. By paying (or having paid through withholding and estimated taxes) 100%, you avoid interest and penalties. If you can't manage that, you can still avoid the penalty by paying 90%. For any additional taxes owed when you eventually file, you will have to pay interest on the unpaid amount going back to the original April due date. The penalty for failing to file is generally more costly than the penalty for failing to pay. For more details on extensions to file and on the penalties for the late payment of taxes, see the FAQ on this topic at myStockOptions.com. If your state has its own income tax (most do), it has its own procedures, rules, deadlines, and penalties for filing an extension and for estimated taxes (discussed below). When your federal and state tax returns are done and you’re ready to move on with your life, you want to make projections of your income in 2019. You should hurry with this, as the first quarter estimated tax payment is due the same day as your Form 1040 tax return! Now that you have experienced the impact of tax changes under the Tax Cuts & Jobs Act, whether it be the loss of personal exemptions, the larger standard deduction, or the limit on your property tax deduction, you can make adjustments on your Form W-4 for withholding. The IRS commissioner has urged employees "to check their withholding again this year to make sure they are having the right amount of tax withheld for 2019." Penalties are calculated on a quarterly basis, so you must make estimated tax payments in the quarter when you earned the income. Use IRS Form 2210 to calculate whether any penalty is owed for underpaying your estimated tax and, if so, the amount of the penalty. You can request a waiver of the underpayment penalty along with Form 2210 if you have a reasonable justification for the underpayment. For the 2018 tax year, we have heard from tax preparers that the IRS is expected to be more lenient in giving out penalties, given all the tax changes and the confusion over the adjusted withholding tables. Details on estimated taxes, including a worksheet and all the due dates, are covered in the instructions for IRS Form 1040-ES. If you have stock compensation, see the FAQs on estimated taxes at myStockOptions.com. Our special one-day conference is coming up soon: Financial Planning For Public Company Executives & Directors. Continuing education, including 8.0 CFP® credits and 7.0 CEP credits, are available. You can register and make hotel reservations now at the conference website, where you can also read praise from attendees for last year’s sold-out conference. Please feel free to contact us for more information (617-734-1979, conference@mystockoptions.com). Amid their busy lives as the year begins, employees and their financial advisors must remember to consider three key numbers in the tax-law provisions that are annually adjusted for inflation by the IRS and the Social Security Administration. These impact their paychecks and basic tax planning for 2019. Some of the adjusted tax-code sections are of interest only to super-wealthy executives and other individuals, such as the federal exemption for estate tax ($11.4 million per individual, $22.8 million per married couple in 2019). Others are chiefly matters for corporate benefit-plan administrators. For example, the income definition of “highly compensated employee,” which affects eligibility for employee stock purchase plans (ESPPs) and 401(k) plan non-discrimination testing, rose to $125,000 in 2019. Below are the top three sets of tax figures that employees should know. They relate to compensation from work involving paycheck withholding, the potential need for estimated taxes, and your retirement savings. Social Security tax (6.2%) applies to wages up to a maximum amount per year set annually by the Social Security Administration. Income above that threshold is not subject to Social Security tax (by contrast, Medicare tax is uncapped, with a rate of either 1.45% or 2.35%, depending on your income level). In 2019, the Social Security wage cap is $132,900, up slightly from $128,400 in 2018. This means the maximum possible Social Security withholding in 2019 is $8,239.80. Once your income is over that amount, you’ll see 6.2% more in your paycheck! The table below can help you understand how an additional amount of compensation would be taxed at your marginal tax rate (i.e. the next highest rate from your standard tax bracket). This tells you whether the taxes withheld according to your preference on Form W-4 will cover the total tax you will owe for 2019. To avoid “penalizing” additional income in your mind, be sure you know your effective or average tax rate. Need To Pay Estimated Taxes? Additional compensation received, such as a cash bonus or income from a nonqualified stock option exercise or vesting of restricted stock units, is considered supplemental wage income. For federal income-tax withholding, most companies use not your W-4 rate but the IRS flat rate of 22% for supplemental income (the rate is 37% for yearly income amounts in excess of $1 million). As shown by the table above, once you know your marginal tax-bracket rate, you may find the withholding rate of 22% may not cover all of the taxes you will owe that on supplemental wage income. In that case, you must either put extra money aside for your 2020 tax return, pay estimated taxes, or adjust your W-4 for your salary withholding to cover the shortfall. In 2019, you can elect to defer up to $19,000 from your paychecks into qualified retirement plans, such as your 401(k). This is a $500 increase over the 2018 limit. The total ceiling for deferrals to defined contribution retirement plans (including any additional part contributed from your employer) rose to $56,000 in 2019, a $1,000 increase. Both of these limits are $6,000 higher if you are 50 or older. The amount of compensation income that can be considered in the calculation for qualified deferrals is $280,000 in 2019. Want To Defer More Income? Look into whether your company has a nonqualified deferred compensation plan, sometimes called an excess 401(k) plan or other name. For more on these plans, see the website myNQDC.com. IRS Rev. Proc. 2018-57 gives inflation adjustments in various income-tax-related provisions. IRS Notice 2018-83 and an IRS table give the annual adjustments related to various tax-qualified retirement plans. Whatever holidays you celebrate, this is the season of giving. If you're charitably inclined and hold meaningful amounts of appreciated stock, such as shares acquired from a stock option exercise, restricted stock/RSU vesting, or ESPP purchase, donating stock instead of cash can be a smart tax-planning move. Given the changes in the rules for itemized deductions under the Tax Cuts & Jobs Act (TCJA), stock donations can reduce your taxes by giving you total deductions that exceed your new increased standard deduction amount. After you have held stock for more than one year and its price has risen, at the time of the donation you get a tax deduction equal to the fair market value of the stock (not its cost basis). If the sale of the appreciated shares would have triggered long-term capital gains, your deduction is up to 30% of your adjusted gross income (20% for family foundations), and you can carry forward higher amounts for five years. The Tax Cuts & Jobs Act increased the income limit for charitable contributions of cash to public charities (from 50% to 60%), but not for charitable contributions of stock. Shares gifted to donor-advised funds receive the same tax treatment. The advice from many experts is to bunch donations so that your itemized deductions go beyond the TCJA standard deduction amounts in 2018 of $12,000 for individuals and $24,000 for joint filers (adjusted annually for inflation). If you do not routinely exceed the standard deduction, you can get over it by bunching donations of stock to charities or a donor-advised fund. With a charitable gift of appreciated securities held long-term, the donation you make and the deduction you get are greater than they would be if you were to sell the shares and donate the cash proceeds instead. That is because when you donate shares, you avoid paying the capital gains tax. Suppose you can either (1) donate $50,000 in stock held more than one year or (2) sell the stock first and donate the proceeds. The stock has a cost basis of $10,000. You have a 40% combined federal and state tax rate on your income and a combined 20% tax rate on capital gains. To obtain a deduction for the current tax year, the stock transfer must be completed by December 31. For electronic transfers from your brokerage account, the donation is recorded on the day it is received (not when you approve the transfer). Plan your year-end stock gifts as early as possible and have ongoing communications with your broker to ensure that the transfer takes place. If you have valuable stock in a pre-IPO company, you will want to start the process especially early. Donations and transfers of stock in a private company can take longer than those for stock in public companies and can raise valuation issues. For a charitable donation of company stock acquired from equity compensation, the tax treatment is the same as it is for donations of any stock to a qualified charity or donor-advised fund. If the donated shares were acquired from incentive stock options (ISOs) or an employee stock purchase plan (ESPP), be sure you donate the shares after you have met the related special holding periods for ISO and ESPP stock (more than two years from grant and one year from exercise/purchase). Executives and directors will also want to review the Section 16 and Rule 144 requirements before gifting or donating company stock. For other ideas on year-end financial and tax planning, see our year-end articles and FAQs at myStockOptions.com. Our section on estate planning has additional content related to gifts and donations, such as charitable remainder trusts. This is the first year-end season when taxpayers with stock compensation must consider the changes introduced in 2018 by the Tax Cuts & Jobs Act (TCJA). Fortunately, the new tax law doesn’t make any huge changes in the usual year-end steps that you and your financial advisor should consider when you have stock options, restricted stock/RSUs and company stock holdings. However, there are some key points to know and discuss with your advisor. For example, the new 22% withholding rate on income from stock comp and cash bonuses (lowered from 25%) could mean you’ll end up with a big tax bill in April. “Tax reform” is the blanket term often applied to the TCJA, which made two major types of changes in the tax laws for individuals. In some areas, the TCJA made straight-up tax cuts. In others, it restructured or eliminated tax provisions. Each of those two categories affects your year-end strategies differently, as explained below. The TCJA modified the income-tax rate and income ranges of each tax bracket, including the reduction of the top income-tax rate from 39.6% to 37%. However, we still have the same number of tax brackets (lucky seven), and the capital gains tax and the Medicare surtaxes remain unchanged. What this means: Whenever you consider exercising stock options or selling shares at year-end (or recognize any extra income), you need to know your tax bracket. Even with the lower tax rates that took effect in 2018, you still want to consider the income thresholds that would trigger a higher tax rate and the Medicare surtax on investment income. Keep your yearly income under the thresholds for higher tax rates and know the additional room you have for more income in your 2018 and 2019 tax brackets. Recognize income at times when your yearly income and tax rates may, according to your projections, be lower. Example: You’re a joint filer with $200,000 of taxable income in 2018 and projected taxable income of $180,000 in 2019, putting you in the 24% tax bracket. You have a $120,000 spread on your nonqualified stock options. By exercising just enough options in 2018 to generate $50,000 of additional income (giving you $250,000 for the year), you can then exercise the remaining options in 2019. This lets you avoid the higher 32% tax bracket and both the additional Medicare tax (0.9%) on the income at exercise and the Medicare surtax on investment income (3.8%) when you sell the shares. The flat withholding rates for supplemental wages, including stock compensation, are tied to the seven income-tax brackets, so those changed too. For income up to $1 million in a calendar year, the withholding rate is now 22%. For amounts of income in excess of $1 million during a calendar year, the withholding rate is 37%. What this means: The 22% rate of withholding may not cover all of the taxes you will owe on income from an exercise of nonqualified stock options (NQSOs) or a vesting of restricted stock or restricted stock units. You must therefore know the tax bracket for your total income and assess the need to (1) put money aside to pay the additional taxes with your tax return, (2) increase the withholding on your salary, or (3) pay estimated taxes. The TCJA significantly raised the alternative minimum tax (AMT) income exemption amount and the income point where it starts to phase out. This greatly alters the outcome of the AMT calculation for many taxpayers. The new tax law also imposed a cap of $10,000 on the amount of state and local taxes (SALT) available for itemized deductions, and it eliminated personal exemptions. What this means: It’s much less likely that you will trigger the AMT with an exercise-and-hold of incentive stock options (ISOs), and if you did you will be able to recover it with the AMT credit more quickly than before. At year-end, you want to assess whether to sell shares acquired from an ISO exercise earlier in the year. You evaluate whether to sell those shares to avoid the AMT or exercise more ISOs up to the income threshold that would trigger the AMT. Because of the changes in the AMT calculation under the TCJA, you now have much more room to exercise ISOs and hold the shares beyond the year of exercise without triggering the AMT. The TCJA also raised the standard deduction to $12,000 for individuals and $24,000 for joint filers. On your tax return, you can either take the standard deduction or itemize. What this means: If you are holding shares that have greatly appreciated in value, donations of company stock, whether directly to a charity or donor advised fund (DAF), can be a tax-efficient way to both make the donation and get you over the $12,000/$24,000 point where it makes sense to itemize. If you’re not always over that amount, you may want to consider bunching donations together in a single year to exceed it. Tax reform should not be the primary factor in decision-making at year-end. In fact, tax rates in general should never be the only reason for exercising options or selling shares, or waiting to do so, at the end of the year. Instead, make investment objectives and personal financial needs, not tax considerations, the driver of your decisions. For more ideas on year-end planning for employee stock options, restricted stock/RSUs, performance shares, or an ESPP, see the year-end-planning section of myStockOptions.com. It's officially Thanksgiving week, which also means it's game time for year-end financial and tax planning. Having a solid year-end playbook is more important than ever for employees with equity compensation who are evaluating whether to exercise stock options, sell shares acquired from equity compensation, or donate company stock to charities. Tax changes introduced in 2018 by the Tax Cuts & Jobs Act (tax reform) significantly affect these year-end-planning decisions. To help, at myStockOptions.com we provide education and guidance on major issues, choices, and strategies for the end of 2018 and the start of 2019 (see our website's section Financial Planning: Year-End Planning). Multi-year planning is always valuable with equity compensation, as you can control the timing of stock sales and option exercises, and you know when restricted stock/RSUs will vest. Employees with equity grants, employee stock purchase plans, and company shares should be aware of the 2018 and 2019 thresholds for higher tax rates on compensation income and capital gains, the additional Medicare tax on compensation income, and the Medicare surtax on investment income. In particular, they may want to consider keeping their income below those known thresholds, if possible, while evaluating whether there is enough withholding to cover the taxes owed. For example, a big restricted stock/RSU vesting could push your income above the level that triggers the highest capital gains tax rate of 20% and/or the Medicare surtax of 3.8% on investment income. If your income in the next calendar year will be less than the level that triggers those higher rates, waiting until 2019 to sell stock could give you a capital gains tax rate of just 15% and no Medicare surtax. However, tax rates should not be the only consideration. Even if you predict that you will be in a lower tax bracket in the future, many experts maintain that tax rates should never be the main reason for exercising options or selling shares, or waiting to do so, at the end of the year. Instead, make investment objectives and personal financial needs, not tax considerations, the driver of your decisions. At myStockOptions.com, the section Year-End Planning has been fully updated for 2018, including revisions for what's different after tax reform. This content includes the following articles and FAQs. What should be on my 2018 year-end checklist of items to review, know, and consider about my stock compensation? What are some key planning strategies at year-end 2018 for restricted stock, RSUs, and stock options? How does tax reform affect stock compensation? Next year I may be in a higher tax bracket. I am thinking about exercising my nonqualified stock options before then to accelerate income into this year. What issues do I need to think about? If I sell stock this year, I can avoid higher taxes next year, including the 3.8% Medicare surtax on capital gains. What issues should I consider? In addition, the calculators and modeling tools at myStockOptions.com allow users to play out various "what if" scenarios with different tax rates and stock prices. For similar education and guidance on year-end planning for nonqualified deferred compensation, employees can turn to myNQDC.com, a separate sibling publication of myStockOptions.com. "Tax Reform 2.0" has hit the headlines, a month after this blog predicted a major buzz about followup tax cuts in the wake of the Tax Cuts and Jobs Act (see our related commentary, Tax Reform Developments: Making Provisions For Individuals Permanent; Capital Gains Indexing). Many of our talking points are now being echoed in the national news media, e.g. in The New York Times this week. One of the most significant proposed tax cuts, the indexing of capital gains for inflation, is a long-recurring idea that has yet again been reintroduced. As explained in the tax-developments session at the recent myStockOptions financial-planning conference, capital gains indexing would routinely increase the cost basis of investments, such as company stock, for inflation. That would reduce the size of your taxable proceeds at sale, as only the inflation-adjusted capital gain would be taxed. It must be acknowledged that the proposed additional tax cuts, especially if made by executive order, are politically controversial. As the NYT article bluntly puts it, the White House "is considering bypassing Congress to grant a $100 billion tax cut mainly to the wealthy, a legally tenuous maneuver that would cut capital gains taxation and fulfill a long-held ambition of many investors and conservatives." Nevertheless, the indexing of capital gains for inflation would, in particular, also make stock compensation more attractive for employees by reducing the amount of tax paid on the gains when shares are sold. It would, however, complicate the related brokerage recordkeeping, cost-basis calculation, and tax-return reporting. After the Tax Cuts and Jobs Act, which took effect at the start of 2018, and with the current focus on more tax changes, tax planning remains at the forefront of public attention in the United States. Taxpayers remain concerned about the most effective ways to minimize taxes and prevent tax mistakes. This year the new tax law added potential confusion to the already complex arena of taxation for stock options, restricted stock, restricted stock units, ESPPs, and other forms of equity compensation. The Tax Cuts and Jobs Act has several provisions that directly and indirectly affect equity compensation, whether in personal financial planning or in company stock plan administration. While the core tax treatment of stock compensation has not been altered, the new law's changes in the income tax brackets have a big impact on taxpayers who receive additional income during the tax year from an equity award or cash bonus. FAQ: How does tax reform affect stock compensation? FAQ: Has recent legislation changed the taxation of incentive stock options (ISOs)? FAQ: How does tax reform affect restricted stock and RSUs? "Tax reform affects financial planning for everyone, even strategies for estate planning and charitable giving," says Bruce Brumberg, the Editor-in-Chief of myStockOptions.com. "When you have stock compensation and holdings of company stock, you layer on an additional set of complex tax rules. With our content and tools, we help our site members and licensing clients make sense of it all." Beyond the Basic and Premium Memberships at our website, myStockOptions.com Pro is a special membership level for financial advisors, CPAs, and other professionals who have clients with stock compensation. It gives full access to the whole website plus special features in the tools, where advisors can track and model stock grants for multiple clients. Access to the vast library of content at myStockOptions.com puts answers to tough client questions right at the fingertips of advisors, who can create PDFs of crucial content with their logo on it for distribution to clients. Organized by myStockOptions.com and held on June 18, the one-day conference Financial Planning for Public Company Executives & Directors attracted financial advisors from all over the United States. These professionals work with or seek to advise executives, directors, and high-net-worth employees who have stock compensation, holdings of company stock, and other company benefits, such as nonqualified deferred compensation. The conference was a big success. All available space was sold out, and the event received glowing reviews from attendees. myStockOptions thanks those who attended, our speakers, and the conference's sponsors: Eaton Vance, Fidelity Charitable, StockShield, StockOpter, Social Security Solutions, and the NASPP. From our experience with financial planners using the content, tools, and advisor directory at myStockOptions.com, we sensed a strong need for this type of event. Moreover, a recent national survey of 1,000 stock plan participants found that while half understand the long-term value of their equity compensation, many are hesitant about exercising stock options or selling shares because of anxiety that they will make a costly mistake. The survey suggests that improved education and guidance would reduce this fear factor. "Financial-planning clients and their families look to equity comp or company stock holdings to fund important life goals," said Bruce Brumberg (pictured at the right), the editor-in-chief of myStockOptions.com, during his introductory remarks. "They rely on advisors for help in how to maximize, preserve, and transfer their wealth and how to prevent them from making big mistakes." Accordingly, our conference team selected stock comp topics that are especially important for advisors to understand in serving their financial-planning clients. Our speakers and panelists shared a wide range of knowledge, insights, and experiences that completely met our high expectations and the goals of the conference. We hope that our conference attendees found the event a boost for their professional development, helping them deepen client relationships, further develop their reputations, gain more client referrals, and advise more employees with stock comp in ways that help them achieve their financial and life goals. The mission of the conference is also one of our perpetual missions at myStockOptions.com: to provide an independent, unbiased source of educational content and tools on all types of equity compensation. Full access to our website is available via our Premium or Pro membership levels. Additionally, our extensive and engaging educational content on all aspects of equity compensation can be licensed by stock plan providers and companies for their plan participants. The content includes not just our easy-to-understand articles and FAQs but also our videos, podcasts, modeling tools, and fun quizzes on many different topics. For those who haven't yet filed federal tax returns, it's getting late in the fourth period, but there is still time to beat the IRS buzzer. The deadline for filing tax returns with the IRS for the tax year 2017 is April 17, 2018. In any tax season, the recognition of income from stock compensation or an employee stock purchase plan can complicate your return. Examples include income from an NQSO exercise, an ISO or ESPP disqualifying disposition, or the vesting of restricted stock. However, as regular readers of this blog will know, this tax season has the potential to be more confusing than most if you sold any stock last year. Issues are especially likely to arise with the cost basis as reported on Form 1099-B and with the tax-return reporting on Form 8949 and Schedule D. For help, including annotated diagrams of Form 8949 and Schedule D, see the special section of myStockOptions.com called Reporting Company Stock Sales. If you need to take the game into overtime, you can get an extension of the federal filing deadline by up to six months. No explanation or signature is needed. You can request an extension in any of three traditional ways: on IRS Form 4868, through a paid tax preparer, or via tax-return software. Note that an extension for your federal tax return applies only to the filing of your return, not to the tax itself, which you must pay by the original IRS filing deadline.Therefore, if you get an extension you must accurately estimate how much tax you must pay by the 17th. By paying 100%, you avoid interest and penalties; if you can't manage that, you can still avoid the penalty by paying 90%. If you owe additional taxes when you eventually file, you will have to pay interest on the unpaid amount going back to the original April due date. For more details on extensions to file and the penalties for the late payment of taxes, see the related FAQ at myStockOptions.com. When your federal and state tax returns are finally done and you're ready to move on with your life, you may want to make projections of your income in 2018. These should be done with the following three planning points in mind. First, as in the past few years, individuals who expect income of more than $200,000 this year ($250,000 for married joint filers) should consider the additional Medicare taxes on ordinary income and investment income that were introduced by the Affordable Care Act (Obamacare). Despite the failed efforts last year to repeal Obamacare, it and the taxes introduced to fund it are still in effect. Second, consider the tax changes that took effect in 2018 under the Tax Cuts & Jobs Act, which has provisions that directly and indirectly affect stock compensation. For details on the impact of these changes on planning for stock compensation and company shares, see the related article on myStockOptions.com. Third, if you expect additional income from stock comp in 2018, and if your withholding rate will be inadequate to cover the taxes you will owe for the full year, you may want to make estimated tax payments, or at least see whether you can adjust your salary withholding. (The withholding rate for supplemental income, such as equity compensation, is 22% up to $1 million during the calendar year and 37% for yearly income in excess of $1 million.) To avoid penalties, be sure you pay the IRS either 90% of your expected tax bill or 100% of this year's taxes (for adjusted gross incomes over $150,000, it is 110%). Penalties are calculated on a quarterly basis, so you must make estimated tax payments in the quarter when you earned the income. Note: Details of estimated taxes, including the due dates, are discussed in IRS Form 1040-ES, and on myStockOptions.com in the sections NQSOs, ISOs, Restricted Stock, and SARs. CE credits will be available! Register at the conference website or contact us for more information (617-734-1979, editors@mystockoptions.com). As 2017 draws to its close, the new tax-reform law is getting a lot of attention, and it will certainly affect tax rates in the future (see this blog's summary of its provisions that affect stock comp). However, don't forget the fundamentals of year-end planning. The checklist below summarizes what you need for comprehensive year-end financial and tax planning with stock compensation. For general financial-planning points to consider with stock compensation at year-end, see a related FAQ at myStockOptions.com. While it's not quite tax "reform," at least for individual taxation, major tax-law changes have now been adopted. The Tax Cuts & Jobs Act has provisions that directly and indirectly affect stock compensation, whether in personal financial planning or in company stock plan administration. (See a handy interactive version of the legislation from the law firm Davis Polk.) Compared with some earlier proposed provisions that didn't survive the legislative process, these are not really significant beyond the change in the alternative minimum tax (AMT), which affects incentive stock options. 1. Changes in the rates of individual income tax. The Tax Cuts & Jobs Act keeps the current seven tax brackets, reducing the rates and changing the income thresholds that apply. The new rates are 10%, 12%, 22%, 24%, 32%, 35%, and 37%, with the top bracket starting at $600,000 for joint filers ($500,000 for single filers). The flat supplemental rate of federal income tax withholding on stock compensation is based on the seven brackets. For amounts up to $1 million it is linked to the third lowest rate (22%). For amounts over $1 million it is linked to the highest rate (37%). The 22% rate of withholding may not cover the actual taxes you will owe, so you need to know the tax bracket for your total income and assess the need to put money aside or pay estimated taxes. 2. Changes in the calculation of the alternative minimum tax (AMT). The income spread at incentive stock options (ISOs) exercise can trigger the AMT, which warrants complex tax planning. While the AMT or how it applies to ISOs is not repealed, below are the new numbers in the AMT calculation (to be adjusted annually for inflation). The 2018 AMT income exemption amount rises to $70,300 (from $54,300) for single filers and to $109,400 (from $84,500) for married joint filers. The income where this AMT income exemption starts to phase out in 2018 is substantially adjusted upward to begin at $500,000 for individuals (from $120,700) and $1,000,000 (from $160,900) for married couples. These higher AMT income exemption amounts, and the much higher income point where the phaseout starts, make it much less likely that ISOs will trigger the AMT. With fewer employees at risk of triggering the AMT by exercising ISOs and holding the shares, companies may start to grant ISOs more frequently, given their potential tax advantages for plan participants. What pays in part for this change in the AMT calculation is the $10,000 cap on the deduction for state and local income taxes and real-estate property taxes on tax returns. Given the odd way in which the AMT is calculated, those deductions may have triggered or added to your AMT in the past. Strangely enough, given that new cap, a taxpayer who has been paying the AMT may see less tax savings than they might otherwise expect to get from the AMT change. 3. New type of qualified stock grant for privately held companies. The final legislation adopted as one of its provisions a version of the Empowering Employees Through Stock Ownership Act. This provision lets an employee in a privately held company elect to defer taxes at option exercise or RSU vesting for up to five years as long as the company's equity awards meet certain conditions (the version of this provision that passed the House in 2016 allowed seven years). For details on the provision when it was part of the Empowering Employees Through Stock Ownership Act, see the coverage in the myStockOptions.com Blog. 4. No change in the capital gains rates (15% and 20%). A reduction in ordinary income rates would lower the difference between your income tax rate and your capital gains rate. This reduced differential might affect your tax-planning decisions, e.g. whether to hold shares at exercise, vesting, or purchase. While there is no change in these rates, the tax law creates a new income threshold for when the rate on long-term capital gains and qualified dividends goes from 15% to 20% ($479,000 for married joint filers and $425,800 for single taxpayers). That threshold is no longer similar to that of the top tax bracket. Furthermore, while the Republican Congress did not seek to alter the capital gains rates themselves, they do still want to repeal the 3.8% Medicare surtax on investment income, including stock sales, that is paid by high-income taxpayers to fund Obamacare. The new tax law simply repeals the penalty for not buying health insurance. 5. Repeal of the performance-based exception to the Section 162(m) limit on deductible compensation. Publicly traded companies will no longer be able to deduct annual performance-based compensation (e.g. stock options, performance shares) in excess of $1 million for the CEO, CFO, and the top three highest-paid employees. For compensation paid under written plans existing as of November 2, 2017, an exemption applies as long as the plan is not modified. While that repeal does not affect financial planning, it further reduces the incentive for companies to favor one type of equity award over another. For further details about the impact of the tax legislation on stock comp, including links to in-depth tax resources, see the extensive FAQ at myStockOptions.com on this topic. Editor's Note: Save the date for the first myStockOptions conference! Here at myStockOptions, we are planning to hold our first-ever conference. It will be a one-day event: Financial Planning for Public Company Executives & Directors (Monday, June 18, 2018). Taking place in the Boston area, this is a must-attend national conference for financial advisors working with or wanting to counsel executives, directors, and high-net-worth employees. We have a wonderful group of expert speakers and a very substantive agenda of sessions on various stock-related and financial-planning topics. For details, see the December issue of the myStockOptions newsletter. Charitable giving at any level is a very worthwhile use of accumulated wealth, such as holdings of company stock. In fact, nonprofits appreciate gifts of shares as much as gifts of cash. As tax-reform legislation increases the standard deduction ($24,000 for joint filers and $12,000 for single filers), donations this year could have more after-tax value for you while you're still itemizing your deductions. At myStockOptions we have an entire section on the topic of gifts and donations involving stock acquired from equity compensation. The commentary below summarizes some of that section's guidance on how to make stock donations as part of your year-end financial and tax planning. For year-end donations, be sure the stock transfer is completed by December 31 to make it count for the current tax year. For electronic transfers from your brokerage account, the donation is recorded on the day it is received by the charity/foundation (not when you approve the transfer). With increased year-end activity at brokerage firms, you should plan your year-end stock gifts as early as possible and have ongoing communications with your broker to ensure that the transfer takes place. For donations of a private company's stock, the process can take longer, so you will want to start it earlier. For a charitable donation of company stock acquired from equity compensation, the tax treatment is the same as it is for donations of any stock to a qualified charity. The tax treatment of gifting stock to donor-advised funds is similar to that of donating stock to qualified public charities. After you have held the company stock for more than one year, at the time of the donation you get a tax deduction equal to the fair market value of the stock (not to your cost basis). For stock acquired from an option exercise or an ESPP purchase, the holding period begins on the day after exercise/purchase, while for restricted stock/RSUs it starts on the day after vesting. If the sale of the appreciated shares would have triggered long-term capital gains, your deduction is up to 30% of your adjusted gross income (20% for family foundations), and you can carry forward higher amounts for five years. With a charitable gift of appreciated shares held long-term, the donation you make and the deduction you get are greater than they would be if you were to instead sell the shares and donate the cash proceeds. This is because when you donate shares, you avoid paying the capital gains tax. Suppose you can either (1) donate $100,000 in company stock or (2) sell the stock first and donate the proceeds. Stock: You donate $100,000 in company stock that you have held for at least one year (10,000 shares trading at $10 per share that you received at $1 per share) to a favorite charity. Your $100,000 tax deduction results in tax savings of $40,000 (assuming a 40% combined federal and state tax rate on your income). Cash: You sell 10,000 shares, worth $100,000, and donate the cash. On your $90,000 gain ($100,000 minus the cost basis of $10,000) you pay $18,450 in taxes (15% federal capital gains tax plus the 5.5% state tax), resulting in $81,550. This amount will be lower if you trigger the 20% tax rate on capital gains and the 3.8% Medicare surtax. You get a tax deduction for the net amount of cash that you have donated. Your tax savings are $32,620 (40% of $81,550), $7,380 less than the tax savings with a donation of stock. If the donated shares were acquired from incentive stock options or an employee stock purchase plan, additional tax consequences occur if you donate the shares before you have met the required holding periods. (See also our FAQs on donating shares from a Section 423 ESPP after meeting the holding period, and gifting/donating ISO shares after triggering AMT.) Executives and directors will also want to review the Section 16 and Rule 144 requirements before gifting or donating company stock. For other ideas on year-end planning, see the year-end articles and FAQs at myStockOptions. Our section about estate planning also has content related to the theme of gifts and donations. Along with awkward office holiday parties, year-end is a key time for financial and tax planning among the millions of employees who have stock compensation or holdings of company shares. In 2017, year-end financial and tax planning can be tricky because of the major tax changes that are likely to occur in 2018 under legislation now in Congress (for background, see our FAQ on that topic). To help, we offer education and guidance on major issues, decisions, and innovative financial-planning strategies for the end of 2017 and the start of 2018. This content is available in the our section Financial Planning: Year-End. At year-end, multi-year planning is especially valuable with equity compensation. You can control the timing of stock sales and option exercises, and you know when restricted stock/RSUs will vest. Along with the financial- and tax-planning concepts that apply at the close of every year, in 2017 you should still consider the ongoing impact of the tax changes that took effect under the American Taxpayer Relief Act and the Affordable Care Act. While the tax-reform legislation in Congress does not affect 2017 taxes, as part of your year-end planning you should consider its potential impact on your tax rates in 2018 and later. These may include a simplification of individual income tax rates and the elimination of the AMT, which could result in a tax cut for many people who are now in the top tax bracket but also could result in a tax increase for others. For example, under the bill in the House of Representatives some taxpayers currently in the 33% tax bracket would move into the 35% bracket for compensation income and short-term capital gains. The current (2017) 33% tax bracket for married joint filers goes from $233,350 to $416,700 of taxable income. The income range for the proposed 35% bracket would start at $260,000, so income above that threshold would move you up to the 35% marginal tax rate. Timely year-end guidance is particularly crucial if you are considering option exercises or stock sales at the end of 2017. Be aware of the 2017 and 2018 thresholds for higher tax rates on compensation income and capital gains, the additional Medicare tax on compensation income, and the Medicare surtax on investment income. If possible, you may want to consider keeping your income below those known thresholds. Convinced that your tax rates will be lower in 2018 and beyond? The general recommendation is to think about deferring income into the future and accelerate deductions into 2017. However, caution is warranted. Even if you predict that your tax rates are likely to change in the future, many experts maintain that tax rates should never be the only reason for exercising options or selling shares, or waiting to do so, at the end of the year. Instead, make investment objectives and personal financial needs, not tax considerations, the driver of your decisions. At myStockOptions.com, our section Year-End Planning has been fully updated for 2017. Its content includes the following articles and FAQs. What are some year-end strategies for restricted stock and stock options? My income next year will trigger higher taxes, including the 3.8% Medicare surtax on capital gains. If I sell stock this year, I can avoid these taxes and then next year repurchase the stock to reset the basis. What issues should I consider? How can employees defer income to years when they are in a lower tax bracket? How do the additional Medicare taxes on high earners affect planning for stock compensation? How do employees harvest capital losses against capital gains from company stock holdings? Are there strategies for using capital-loss carry-forwards from prior years? What risks are posed by the wash sale rule? What year-end strategies can help to minimize alternative minimum tax with incentive stock options? How can employees save taxes on company stock by making gifts and donations, including those to private foundations or grantor-retained annuity trusts? All of these questions, and many others, are answered in the section Financial Planning: Year-End Planning. In addition, the calculators and modeling tools at myStockOptions.com allow users to play out various "what if" scenarios with different tax rates and stock prices. The contribution limits for qualified plans are provided under Section 415 of the Internal Revenue Code, and every autumn the IRS announces figures for the following year. The limits are adjusted annually for inflation. While there are slight increases in some limits for 2018, in others the 2017 figures continue. What this means: The changes in limits from 2017 to 2018 are slight. If you have already maxed out your qualified plan contributions for 2017, you will probably do the same in 2018, so you will need to rely on NQDC plans to defer any salary and bonus increases you expect in 2018. The table below presents the qualified plan limits for 2017 and for 2018 (increases marked in red). See also the IRS release announcing the 2018 figures. Set by the Social Security Administration, the Social Security wage cap will rise in 2018 to $128,700, a slight increase from $127,200 in 2017. With the 6.2% rate of Social Security tax, the maximum possible Social Security withholding in 2018 is $7,979.40. For a table comparing the features of 401(k) plans and NQDC plans, and their relative advantages and disadvantages, see an FAQ at myNQDC.com. myNQDC.com is available through individual premium memberships or through corporate licensing. Premium members have access to all of myNQDC.com, including the Learning Center, which offers up to 6 continuing education credits for CFPs, 6 PACE credit hours for CLU® and ChFC® professionals, and 12 CPE hours for ASPPA members. To learn about the corporate services offered by myNQDC.com, please see the website's About Us and Licensing sections. Repealing and replacing the Affordable Care Act (Obamacare) has become a top priority for the Trump administration and the Republican-controlled Congress. 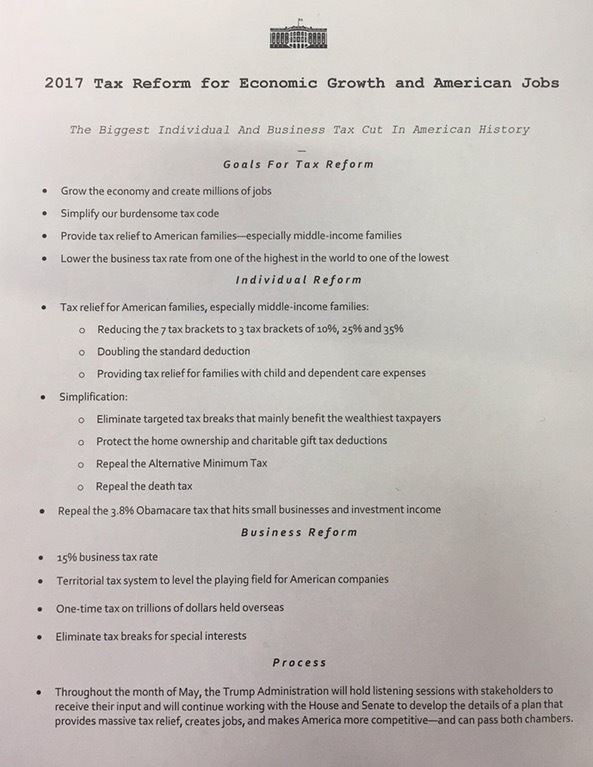 This controversial desideratum appears to be a higher priority than the general tax reform proposed by the president (discussed in an article on myStockOptions.com). Earlier this month, the House of Representatives passed the American Health Care Act (AHCA), its second attempt to repeal and replace Obamacare (the first effort failed in March). To be enacted, the legislation must still be adopted by the Senate, where changes are expected. For details on the bill, see a special report from CCH. The AHCA would eliminate the Net Investment Income Tax: a 3.8% Medicare surtax on investment income, including capital gains, dividends, and interest. Meanwhile, an amendment to the House bill would delay until 2023 the repeal of the Additional Medicare Tax (0.9%) on ordinary income (see Sections 213 and 251). Those taxes currently apply to everyone with yearly modified adjusted gross income (MAGI) of more than $200,000 (individuals) or $250,000 (married joint filers). The AHCA would also eliminate the $500,000 limit on the corporate deductibility of compensation for officers, directors, and employees at health insurers. The important debate over health care and public policy raised by the Obamacare repeal is beyond the scope of myStockOptions.com. It is our role, however, to acknowledge the effect that the law's repeal would have on the taxation of stock compensation. As explained in detail by an FAQ on myStockOptions.com, the tax provisions in question both directly and indirectly affect stock plans and individual tax planning, so you will want to follow the related developments. Currently, under the associated IRS guidelines (starting at Question 33), companies must withhold the 0.9% additional Medicare tax on any type of pay, including that from stock compensation (e.g. NQSO exercise or RSU vesting), when an employee's wages for the year are more than $200,000. While the legislation would remove that requirement, it would not do so until after 2022. The 3.8% Medicare surtax on investment income also can be triggered by stock compensation (though you pay the surtax with your tax return rather than through withholding). For example, an exercise of nonqualified stock options or a vesting of RSUs could push your MAGI over the related income thresholds. If you were to sell shares in the same year, your income would then trigger the 3.8% surtax on top of the capital gains tax (15% or 20%) on the investment income from the stock sale. We have found that people with stock comp and their financial advisors often develop strategies to avoid the surtax. If it is eliminated, that planning concern would go away. 1. Simplification of individual income tax rates. The outline proposes just three income-tax rates: 10%, 25%, and 35%. As we have mentioned, how changes in income-tax rates would tie into the flat supplemental rate of withholding on stock compensation is unclear and would need clarification, as the structure of the rate is based on the current seven tax brackets. 2. No change the capital gains rates (15% and 20%), but a cut in tax on investment income. While Trump does not seek to alter the capital gains rates, he does want to the repeal of the 3.8% Medicare surtax on investment income, including stock sales, that is paid by high-income taxpayers to fund Obamacare. A reduction in the difference between ordinary income rates and the capital gains rates might affect tax-planning decisions, e.g. whether to hold shares at exercise, vesting, or purchase. As for the Medicare surtax, we have found that individuals and their financial advisors often develop strategies to avoid it. If it were eliminated for tax years after 2017, that planning need would go away in 2018. However, for the remainder of 2017, you would want to consider whether you can defer income (e.g. NQSO exercises) into 2018 if that income would push you over the threshold for triggering the Medicare surtax in 2017. 3. Termination of the alternative minimum tax (AMT). Among those who receive grants of incentive stock options (ISOs), much rejoicing would occur if the AMT were repealed. Currently, the income spread at ISO exercise can trigger the AMT, which warrants complex tax planning. 4. Elimination of the estate tax. That would end the need to implement most gifting strategies with company stock, including those involving transferable stock options. However, estate-tax repeal might also end the step-up in the basis of investments, such as company stock, that currently occurs with a deceased person's holdings. That would create the need for other estate-planning strategies. Don't expect the Trump administration's tax plan to become adopted legislation soon. As an article in The New York Times points out, numerous obstacles stand in the way of its enactment this year. In addition, as the political news website The Hill reports, the lack of detail in the tax-reform plan is setting off aggressive lobbying efforts, which will take time to play out. Plus, as columnist Bernie Becker notes at the news and commentary website Politico: "THIS THING HAS TO GET THROUGH CONGRESS: That sort of goes without saying, but there's really no better idea how that happens than there was before the newest Trump principles." For the many upper-middle-class employees and managers who receive stock compensation, there is an important issue to follow with any type of tax reform (though we remain uncertain about whether Trump's proposal represents reform, simplification, or just a big tax cut). That issue involves the taxable income that would fit into the three proposed tax brackets (the Republican tax-reform blueprint takes a similar approach with rates of 12%, 25%, and 33%). Journalists in the news media tend to focus on the tax rates themselves, not the tax-bracket thresholds, which are also significant aspects of any tax law. The proposals merely cut off the current top tax brackets, which could mean that anyone currently in the brackets between 25% and the new top bracket would get stuck paying a higher rate both on ordinary income and on short- and long-term capital gains. (The 20% top rate on long-term capital gains and qualified dividends is currently tied to the top income-tax bracket.) For example, in 2017 if you have taxable income between $153,100 and $416,700 (married, filing jointly) or $91,900 and $416,700 (single), you are currently in the 28% or 33% tax bracket. Aside from the most senior executives, individuals with stock compensation tend to be in that income range. In the interests of both economic growth and fairness, myStockOptions.com has long contended that it would be better to keep the current top income-tax rate of 39.6% and instead broaden the 25% rate to encompass those in the current 28%, 33%, and 35% marginal tax-rate brackets. It is the upper middle class in this income range that would be most likely to either spend the money from this tax reduction, boosting the economy, or save it to bolster lagging college and retirement savings. For more on the tax-reform principles released by the Trump administration, see commentaries from Ropes & Gray, Latham & Watkins, and PwC. In addition to the potential impacts we describe here, the NASPP blog covers further ways in which the proposals could affect stock compensation. Enter your email address below to receive our blog commentaries in your inbox.